I recently gave a presentation to the Peoria Camera Club about digital portrait retouching, a presentation cleverly titled “Reach Out and (re)Touch Someone.” I started the presentation with a quick rundown on the five things I do to every portrait I retouch, especially when I have a few minutes to edit before a deadline. I never realized until I was planning the presentation that I did the same things over and over for a quick retouch, but when I saw what I saw, I was delighted to share this with my fellow camera club members. With that in mind, I’ve decided to pass some of that knowledge on to all of you. Wait a minute, though, Mike… isn’t that giving away trade secrets? Well, kind of, I guess, but to be honest, there are so many techniques and tricks to portrait retouching out there, including ones that I will never divulge (unless there is bribery in the form of chocolate involved) that I’m not that worried about it. Plus, if I recall correctly, a wise man once said “what’s the point of knowledge if you don’t pass it on?” and I like that. 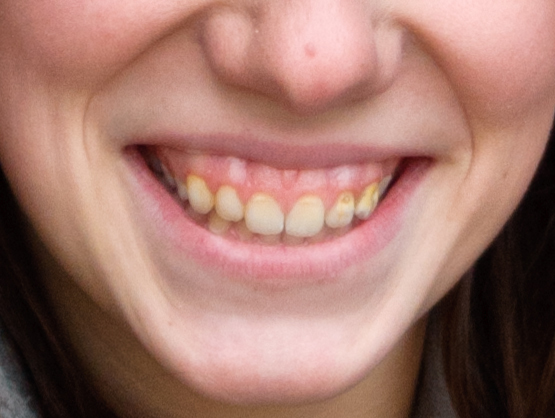 So, without further ado, here are my three simple steps to whitening teeth in Photoshop! 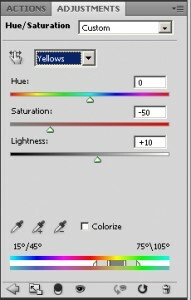 Once you have the image you want to edit open in Photoshop, add a Hue/Saturation layer. 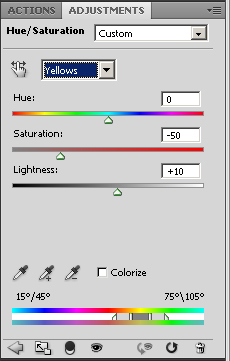 You may also choose to duplicate the layer (CTRL + J) and do a general hue/saturation adjustment, as outlined below, and then add in a mask, but you can kill all those birds with one stone by just hitting the Hue/Saturation layer button. Dial -50 saturation and +10 brightness for the yellow and red channels; this will kill off the majority of the yellow on the teeth and even add in a touch of brightness to them as well. Go ahead and dial in the same settings for the blue and master channels as well. Why don’t we go to -100 saturation you ask? Well, give it a whirl, but my experience is that removing all color gives the teeth an unnatural look or even another yellow cast on the reverse end. The image will look pretty weird at this point as the adjustment layer has been affecting the entire image. We’ll fix that by selecting the layer mask and inverting it (CTRL + I). This will hide the entire adjustment from the image. With your layer mask still selected, grab your paint brush, set your foreground color to white and make sure your brush is really soft. Zoom in on the teeth and paint the adjustment back in on the teeth only. Voila! That’s all there is to it. As you can see from the before/after images, the model’s teeth are now pearly white without a stock investment in Crest Whitening Strips! As an added bonus, this technique works wonderfully for the whites of the eyes as well!